Fungal spores are present everywhere and they can infect toenails if the nails are weak or if the toenail has been damaged. Once a toenail is damaged the fungal spores can easily gain access to the toenail and the nail bed. Once the area is infected and the fungal spores are present in the old infected nail they infect the new toenail growth. 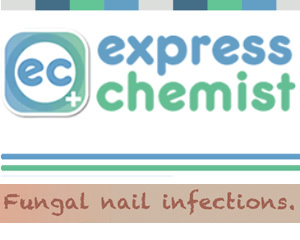 This means that the fungal spores continue to affect the nail as it grows, and the damaged part of the nail does not grow out with the growth of the nail unless the new growth is protected from the old infected nail by an antifungal agent. The fungal spores can attack either the toenail and/or the nail bed. The damaged nail might have white and/or yellow spots, might be yellow or brown in colour and be weak and crumble easily. The nail may be thickened which can be painful. The nail often looks very unattractive and unhealthy. At first the toenail is normally not painful. However in time if the nail thickens and then walking might become uncomfortable because the thick nail can press against the top of the shoe. Several nails might be affected or just one nail. The fungal spores can spread from the skin (if athletes foot is present) into the nail. A recently damaged nail is more likely to become infected. Fungal spores like dark, damp places and the feet are ideal area in this respect. A topical treatment (meaning a drug placed directly on your skin rather than something you ingest) and it is recommended for mild and moderate fungal nail infections. Canespro softens and gradually removes the infected part of the nail. 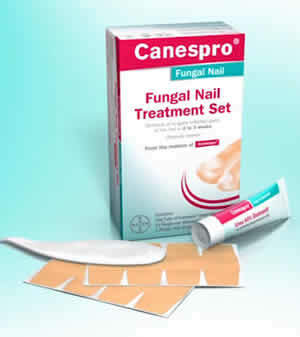 Canespro ointment has to be applied daily on the infected area of the nail, which is then covered by a plaster for 24h. Then, the softened part of the nail can be gently removed with the plastic tool. This gentle removal usually takes 2 to 3 weeks, and enables you to get to the main root of the infection (as in most cases fungal nail infections occur under the nail plate, on the nail bed). Lamisil - discuss this with your GP. The treatment is not suitable for every patient. Consult a chiropodist or podiatrist who will remove the nail after the area has been numbed with a local anaesthetic. This is not suitable for everyone or every nail and is considered a last resort. Complications of this procedure - damage to nail, secondary infection, re-infection. Scholl: Scholl Fungal Nail Treatment can be very effective in killing toenail fungus. Just paint the nail liquid on daily for 4 weeks (file once per week), then once per week for 9-12 months to allow your damaged fungal toenail to fully grow out. 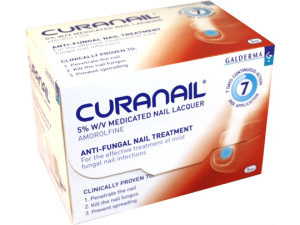 The fungal infection can spread to other nails or the fungal infection which only affects part of the nail at present can eventually affect the whole nail. Depending on the type of fungal infection the nail may excessively thicken and cause pain and bacterial infection or the nail may gradually disintegrate. Can also cause further infection of the surrounding skin.